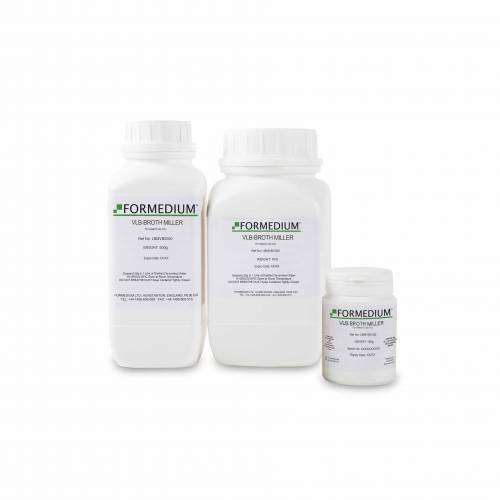 LB Broth Miller is a nutritionally rich medium originally developed for growth and maintenance of recombinant E. coli strains. E. coli is grown to late log phase in LB Broth. These strains are generally derived from E. coli K12 which are deficient in B vitamin production. K12 has been ultimately modified by specific mutation into an auxothropic strain not capable of growth on nutritionally deficient medium. 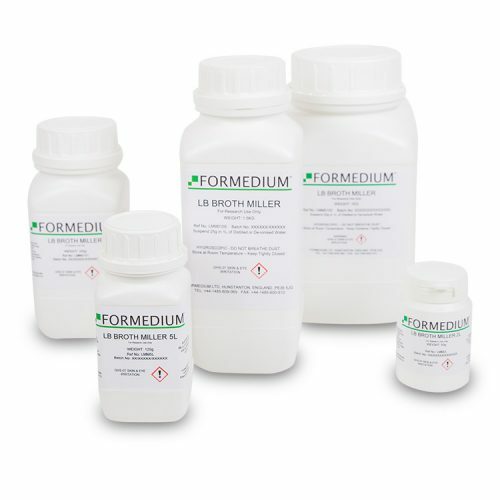 All nutritional requirements of E. coli strains are provided by LB Broth. Peptides and amino acids are abundantly present in Tryptone. Yeast extract is a rich source of amino acids, vitamins, nucleotides and carbohydrates. These nutritional elements in LB media, which otherwise the cell would have to synthesize, support a luxurious growth of E. coli cells.Sodium ions for transport and osmotic balance are provided by Sodium chloride. The concentration of NaCl in LB Miller is twice the concentration of the LB Lennox Broth formulation and twenty times the concentration of LB Luria Broth formulation.These variations in Sodium chloride content make it possible to select the optimal salt concentration for a specific strain.Luria, S.E. and J.W. Burrous, Hybridization between Escherich coli and Shigella, J. Bacteriol., 74, 461-476. 1955. Luria, S.E., J.N. Adams and R.C. Ting, Transduction of lactose-utilizing ability amongst strains of E. coli and S. dysenteria and the properties of transducing phage particles, Virology, 12, 348-390, 1960. Lennox, E.S., Transuction of linked genetic characters of the host by bacteripphage P1, 1, 190-206, (1955). Sambrook, J,., E. F. Fritsch, and T. Maniatis, 1989, Molecular cloning: a laboratory manual, 2nd edition ed., Cold Spring Harbour laboratory, Cold Spring Harbour, N.Y. Assubel, F.M., R. Brent, R.E. Kingston, D.D. Moore, J.G. Seidman, J.A. Smith and K. Struhl, Current protocols in molecular biology, vol. 1, Current Protocols, New York, (1994).